Aaxeon Technologies is proud to announce the release of their IP67 rated Industrial High-Power 802.11b/g/n Outdoor AP/Bridge/Client. With its 802.11n standard compliance capabilities, the APX-3100 supports higher throughput and features a 600mW radio for faster communication and longer reached distances than a traditional 802.11g outdoor access point solution. The IP67 wifi access point features IEEE 802.3af PoE compatibility, enabling it to be used in locations where socket availability is limited or nonexistent. A web based utility offers system administrators an easy method to upgrade firmware and manage the device over the Internet. When using SNMP, the outdoor access point can support multiple access point configurations from one location. The Outdoor AP/Bridge/Client’s easy to install elements no longer make the installation a tedious or complicated process. The APX-3100 2.4GHz IP67 wifi access point highlights outstanding throughput performance and a cost-effective design guaranteeing reliability at an affordable price, and making it an ideal choice for many industrial applications. 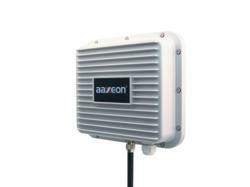 For more information on the APX-3100 802.11n access point, please visit our website at http://www.aaxeon.com.